I had a bit of a moment in the grocery store the other day. I was in the fresh produce section when I came across a knot of other shoppers. This being London, no one quite knew which way to go, so it didn't take long before a hopeless traffic jam of shopping carts stopped everyone in their tracks before, polite Canadians that we are, we slowly extricated ourselves from the brightly lit commercial kill zone. As I stood in the middle of the grocery-festooned zoo, I found myself staring at the almost embarrassing overflow of goods available for sale. The fruits and vegetables made for quite the riot of colors and textures virtually everywhere I looked, and I couldn't help but think that any planet that can create all this cool, edible stuff has got to be a pretty magical place indeed. I don't even know what I shot in this particular frame, but I decided it was interesting enough to use as the launch photo for this week's theme, food from the earth. Are you game? 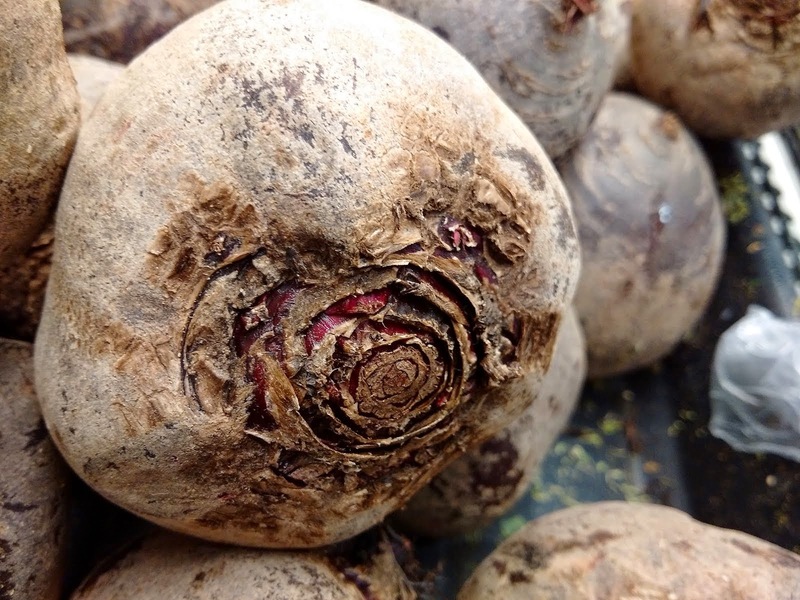 Your turn: Take a photo that evokes or suggests this week's "food from the earth" theme. Post it to your blog or website, then leave a comment here letting other folks know where to find it. Visit other participants, and feel free to share additional pics through the week. If you're new to Thematic, or want to explain it to a newbie, head here. Otherwise, happy shooting. Can't wait to see what you come up with this week! I think that's beetroot. I have been really busy in the last week or so, but may be able to come up with something in the next few days. I raided the kitchen for inspiration. I shall be travelling from tomorrow so it may be Friday before I am able to visit other posts. The theme this week is making me hungry! It came from the earth, though it acquired its sprouts in the fridge (& bag). Good timing, by the way; just took it Sat. Ah! Food. Our favorite pasttime. Carmi, here’s our veggies.